Jeb Bush campaign overhypes Hank Greenberg's $10 million super PAC donation. 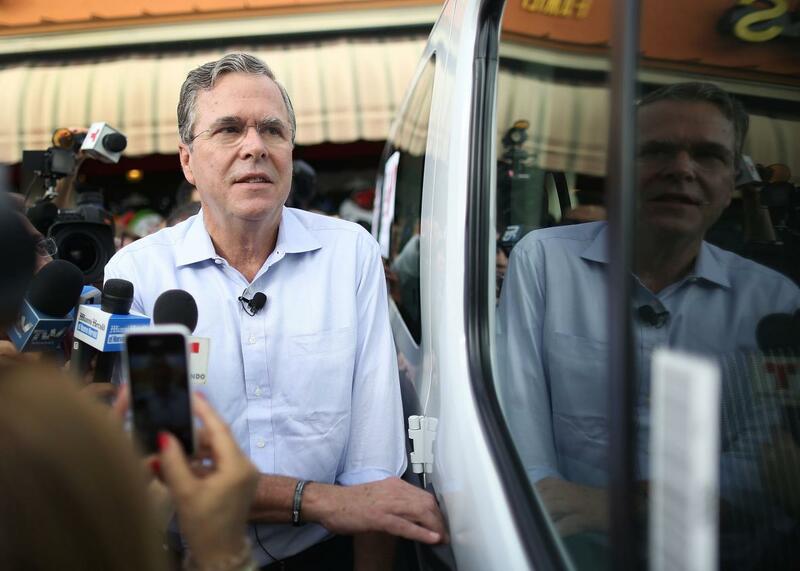 Jeb Bush holds a meet and greet at Chico’s Restaurant on Dec. 28, 2015, in Hialeah, Florida. The Wall Street Journal on Thursday offered up what seemed like some desperately needed good news for Jeb Bush: former AIG chief Hank Greenberg “has donated $10 million” to the super PAC backing the former Republican front-runner. At first blush, the report can be read one of two ways: as a fresh vote of confidence for a candidate who’s floundered spectacularly despite being the early establishment favorite, or evidence that some billionaires have so much money that they’re willing to light some of it on fire. Team Bush, of course, wants everyone to see it as the former—and will no doubt be thrilled that the report has already been widely circulated at face value. The donation, a top Bush adviser told the WSJ, is “great news” and a “really big deal” for Jeb. That might be true in the sense that money still matters in presidential elections—even if so far this cycle it hasn’t mattered nearly as much as Bush and his wealthy friends would have hoped. In reality, though, the report may be less like great news and more like old news. Crucially, the report doesn’t specify when the donation was made, and both Greenberg and Bush’s Right to Rise super PAC declined to discuss the donation on the record. Under FEC rules, super PACs have to disclose a list of their donors only twice a year. Since Right to Rise’s last filing ran only up until June 30, 2015, Greenberg could have theoretically cut his check this summer when Bush was leading the national polls, this week when he is decidedly not, or anytime in between.